Like any surface in the house, flooring requires careful and thorough care. Improper and untimely care can lead to a change in color and structure and lead to wear of the coating. Each kind of flooring requires special care. The most common coatings – linoleum, laminate, parquet, ceramic tile, stone floors, marble. Parquet, laminated and wooden surfaces are subjected to high loads, which is why they are made of especially durable materials. One of the main is a tree that has high strength, excellent physical and chemical properties. But, in turn, requires special care. Maintaining a constant temperature and humidity in the room. The cleaning tool should not be with steel edges, the brush should not have a rigid pile. After coating the parquet with varnish, it is necessary to maintain a gentle mode for a while, during the first ten days it is not necessary to conduct wet cleaning. 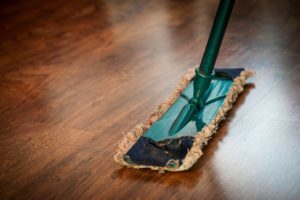 Floors from a laminate clean a vacuum cleaner, a broom or a dry rag. It is not recommended to cover with varnish, wax or other polishing agents. It is also necessary to comply with the temperature regime and monitor the humidity of the air. Stone floors are put in order by means of dry and wet cleaning, polishing, crystallization, waxing and varnishing. Dry cleaning is done by special rags or vacuum cleaners with roller ends. Wet cleaning is done by special mops (rags) or flat mops. You can also clean using a floor scrubber. After wet cleaning, the stone surface must be passed with a dry cloth, in order to avoid the deposition of salts. Once a year, or as necessary, polish stone or marble surfaces with polishing machines. Before polishing the floor should be rinsed and wiped dry, as well as apply a special tool – Maintainer, to avoid erasing the surface of the stone. After polishing, you can treat the floors with wax or wax preparations.